Dr. Riggs takes the time to explain the results of your eye exam, describe your options and listen to your eye care needs. Because maintaining good eye health is an ongoing partnership, we encourage you to ask questions and share your health information, which could be vital to monitoring, diagnosing and treating potential vision problems. Born in Kansas, Dr. Riggs spent most of his childhood in the Los Angeles area. He graduated from Whittier College in 1977 with a degree in Chemistry. In 1981 he received his O.D. degree and was in the top fourth of his class. His private practice started in 1983. For several years he was Optometry Director at a community clinic in San Diego. In 1990 he became a Fellow of the American Academy of Optometry. In 1996 he served as an Expert Examiner for the State Board of Optometry. 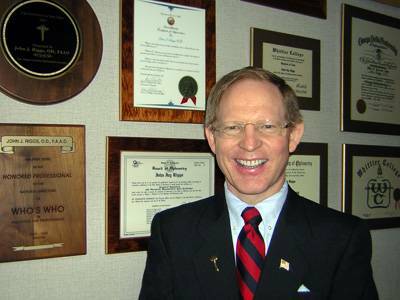 He received the San Diego County Optometric Society Optometrist of the Year award in 2005. In 2008 he was the President of the San Diego County Optometric Society. In 2013 he became one of the first three OD’s in San Diego County to be board certified by the American Board of Optometry. Dr. Riggs and his wife attend Seacoast Community Church in Encinitas.